is created by the marriage of meticulously selected casks, both Sherry (Pedro Jimenez and Oloroso) and Bourbon, this single malt Irish whiskey is a small piece of history, unique and rare. Delicate, dry, with citrus and subtle vanilla notes, it dances across the palate and finishes, long and slow, with elegant complexity. It is distilled in the hugely popular distillery in Dingle, Co Kerry. The very special stills are a key part of the Dingle Story. They take the best Irish malted barley and make pure pot still malt whiskey. Then they put it in casks and let the mild, moist, unique Dingle air do the rest. No whiskey in Scotland or Ireland experiences a maturation process like that. 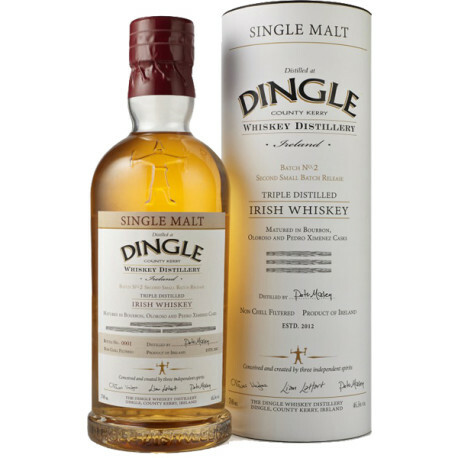 Dingle Single Malt Whiskey has just been launched in very limited quantities.